Discussion in 'First Time Marijuana Growers' started by Dorklover664, Apr 23, 2006. Successful cloning requires cleanliness, warmth, healthy stock, and a little TLC. Clones are sensitive to their environment; harsh conditions (ie. cold & damp) will delay rooting and increase mortality. Rockwool is an excellent medium for cloning: sterile, cheap, biodegradable, and portable, rockwool can be transplanted into any system with minimum transplant shock. How many clones should I cut? There will always be natal differences between clones; sheer numbers will compensate for poor performers and mortality. The faster rooting clones have the most vigorous vegetative growth and usually the best flowering potential. I suggest taking 50% more than you need. <DIR><DIR>Note: always use "high quality water" when watering clones- distilled, reverse-osmosis (R.O.) or "24 hour" tap water left for 24 hours to dissipate chlorine. All water should be at room temperature. The moms should be healthy, pest/disease free and fully into vegetative growth. Clones can be taken off moms up to 2 weeks into flower; however, these flowered clones experience shock and are often difficult to root. I like to foliar feed the mothers with a Growth Plus (A Nitrozyme kelp extract containing growth hormones and vitamins) 3-4 days prior to cloning to encourage lush ad healthy shoot growth. It is recommended to reduce the amount /ratio of Nitrogen in the mother's nutrient solution 3 days prior to cloning (flush soil mothers with water). Nitrogen inhibits root growth; reduced N levels in the mother should help the clones root faster. Some growers do not like to top their moms, preferring to take clones from lower shoots to maintain vertical growth. Lower shoots contain more stored starches, giving the clone more stored energy. Top shoots contain higher levels of growth hormones (ie. auxins) for faster root development. Immerse cubes for 24 hrs. <DIR><DIR>I use plastic "Grodan 77" inserts (11 cubs per insert, 5 inserts/tray for 55 clones/tray); ) keeps cubes upright, evenly spaces, and slightly raised. Labeling your mom and the clones taken from a particular mom is a good idea to backtrack on a "monster mom". Exposed clones will wilt within a few minutes, so it is best to have all materials ready before start to take cuttings. Dip scissors and razor blade into alcohol (grease is used to separate razor blades). Wipe cutting board with alcohol. Drain cubes, place in tray. Cover prepped cubes with dome until you are ready to start (I like to pre-warm the Rockwool by putting the filled tray on the heating mat for Â½ hour before I start taking cuttings). Actively growing tops are preferred, as they contain the most growth hormones. Clones taken lower down are often spindly and less developed. I prefer 3" top clones with a 1/8" stem, 2-3 fan leaves and a slightly firm (but not yet wooden stem. I prefer short clones (no more than 2-3 nodes), otherwise the newly forming roots must support a larger leaf and shoot. The clones should also be â€˜mature', with alternating leaves. Immature clones have leaves opposite each other and are usually pale and spindly. 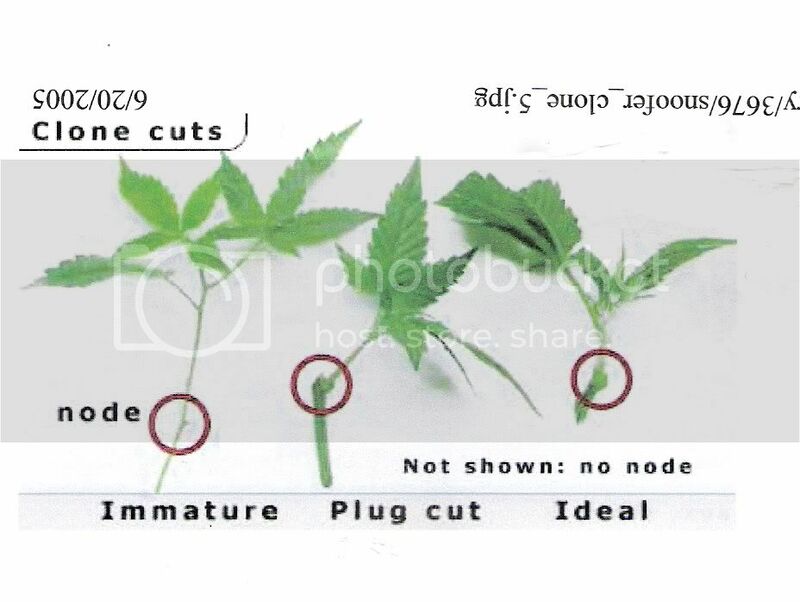 Avoid stem cuts (no node) and plug cuts, as they do not root nearly as well (roots from primarily at the nodes). Trim larger fan leaves in half to minimize the leaf area the newly forming roots must support. Select a vigorous growing top on the mother, cut the main stem just above a fan leaf / auxiliary shoot node about 2 nodes down (as shown in red in the image). The cut can be done with trimming scissors or razor blade. 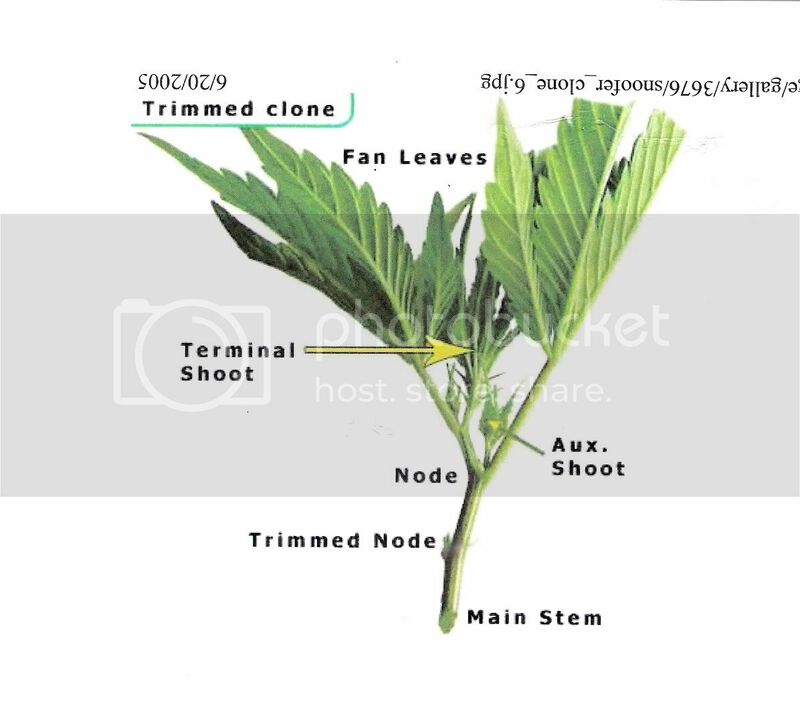 Once the growing top has been selected and cut from the mother, trim shoots and fan leaves from the lowest nodes (as seen in the image). The lowest node will be inserted into the rockwool. Cut 1/4" below the lowest node with the razor blade at a 45-degree angle on the cutting board for a clean cut. This 'ideal' trimmed clone was taken from a vigorous top. A fan leaf and shoot were both removed at the lowest node. The clone will soon be inserted dipped into gel, then inserted into a rockwool cube. Trim large fan leaves in half (Reduces transpiration; the newly forming roots don't have to initially support as much leaf). Dip the trimmed clone into the cloning gel, make sure the lowest node is also thinly coated with gel. Remove any excess on the cut surface itself (So the cutting does not suffocate). Gently push the stem into the rockwool. If the hole is too big, gently squeeze the rockwool around the stem to seal it. Spray inside of humidity dome with No-Damp solution (Do not spray clones directly, as this can encourage powdery mildew). Rotate edge clones to keep their leaves inside of the tray. Cover the freshly cut clones with the dome. Put the clone tray + dome under "warm white" fluorescent lights (Unrooted clones require low light levels. Do not blast them with direct HID lights!). <DIR><DIR>The humidity dome should be left on for 2 days, lifted daily for air exchange. On the 3th day I like to prop up the dome W' (slightly) on one side to acclimatize them (If wilting occurs, leave dome on for another day and try again). On the 4th day I remove the dome. Roots should begin to exit the cube 5-10 days. roots show, you may have to water twice a day to keep the roots moist. Mix 5.6-5.8 pH "24 hour" water and fill solid tray about halfway with water. Note: After the dome has been removed, add small amounts of nutrients -Micro + Bloom + 1drop/gal SuperThrive. Dip clones + inserts + slotted tray into the V2 filled solid tray. Make sure all clones are getting water by 'swirling' the edges of the tray. Lift clone tray out and allow to drain. Shake tray to remove excess moisture. Place clones back under fluorescent lights, and a gentle fan. Roots should begin to exit the cube in 5-10 days. A gentle upward tug on the clone will tell you if it is rooted (only do this after 5' days). Unrooted clones will pull out. Roots may be present, but not yet exiting the cube. If in doubt, carefully open the cubes. Clones will draw their nutrient needs internally from it's fan leaves, which may turn slightly pale. This is a good sign, as it is proof the clone is actively growing. Adding weak nutrients is recommended at this point. Unrooted clones often appear healthy and green (and will stay that way for weeks!). I prefer to sort out the clones (unrooted, few roots, vigorous) into their own trays. Roots should be white and fuzzy. If a clone has not shown roots in 2 weeks, I'd consider removing it Brown roots indicate rot. Occasionally, root tips will become air burned: a sign to water more often! Weak nutrients (50-200ppm) should be started on the rooted clones, and watered more frequently to avoid drying the exposed root tips out. You could also try a weak foiliar feeding with Growth Plus (or any kelp extract). Begin to increase Nitrogen levels. </DIR></DIR><DIR><DIR>Once the clones have fully established roots, they can be put under weak HID light and a weak (250500ppm) nutrient regime, or outplanted into soil, hydro or aero systems. Do not put the clone tray directly onto a heating mat. The heat will cook the roots, even on a timer. It is better to raise the tray off the mat. I use 2 coroplast strips to sit the tray on, raising the tray approx. 114". required to reduce temperatures. I run my mats 5 min on, 10 min off, 24/7 on a cycle timer. The heat will dry out the clones quickly, and daily watering will be required. Occasionally, fresh cloning gel will be very thick. Add some water to container, shake. The gel should pour easier. Some cloning gels have no fungicide (ex. Rootmax); fungicides inhibit root growth somewhat, but prevent damping off. If you are using rooting powder, take care to remove excess powder from the stem cut as you plant the cutting, as this can inhibit the uptake of water. Give your rooted clones a foliar feeding with Growth Plus (or any Kelp extract) to give them a quick growth boost once they have shown roots. any pics of cloning devices? Doesn't go into as much detail, but i think the photo's may help compliment what you've said here. Thanks for taking the time to post that, i'm sure it will come in very handy for lots of new cloners. Great post, and the pictures really help show just where the cut needs to be. I've been looking around for something just like this for cloning. thanks!!! i had a quick question. i have a plant that is about 6 weeks old and it is def. ready to be topped/cloned. however, everytime i tried to clone using jiffypot my cutlings always ends up drowning. when i dont water however, it shrivels up very quick and wilts. i am using rootech powder hormone. "the top rule" ie...fourth node, also applies to clones. 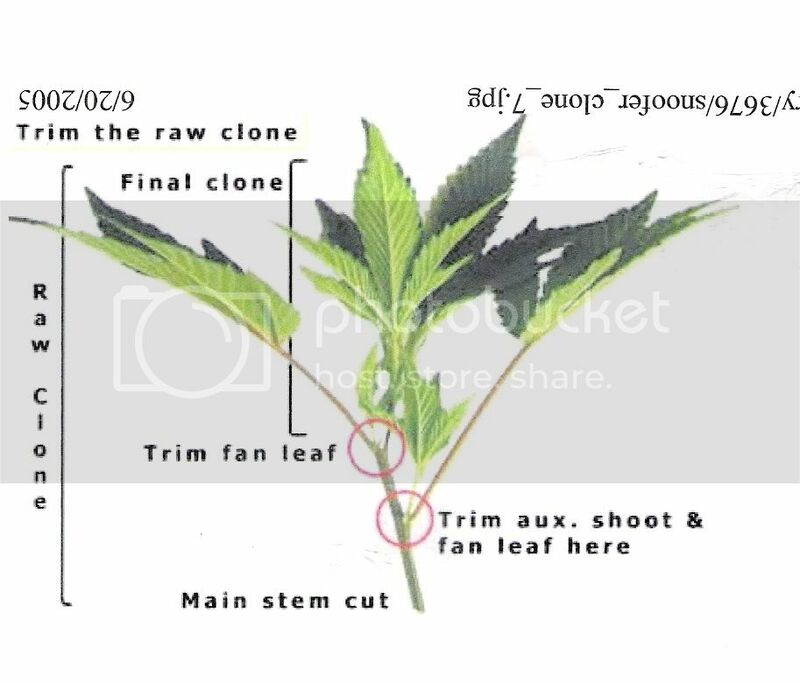 It is not very complex...No matter the method, the key is to make sure it has two fan leaves and a top coming out of the middle, ideally four nodes on the branch so the amount of leaves are strong enough to easily grow roots. 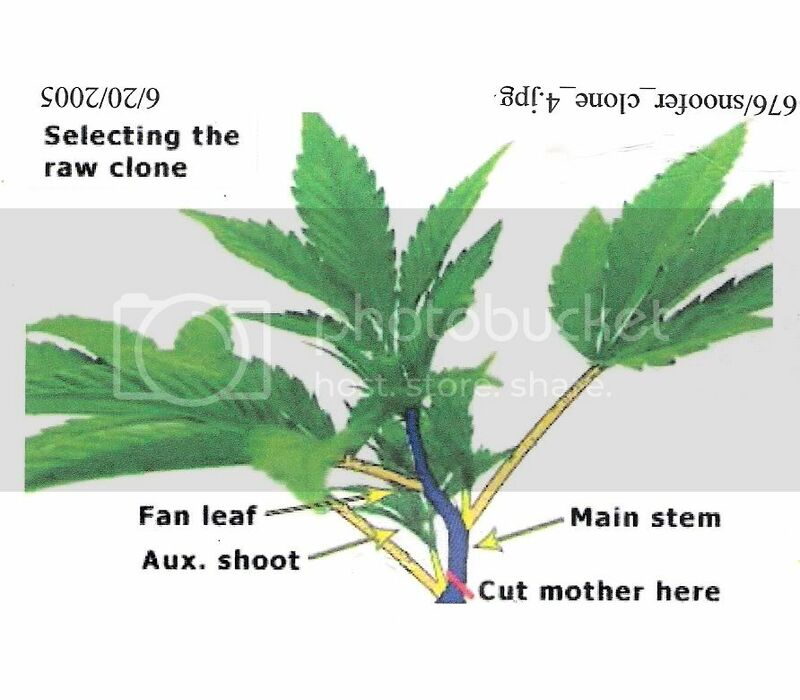 The pictures definitely help me understand what im going to need to do wen i decide to clone but my problem is i don't have a mother plant yet. I was gonna start around 4 plant in soil from bag-seeds and then get rid of the males. Once i do that do i let it grow a few feet and then start flowering it, and then take clones off of it and how long should i wait into flowering to do that, any info would be greatly appreciated and again the pictures are awesome and will help alot. Do the clones require periods of total darkness? If so how many hours from day 1? Do you need a "plant food" like super thrive or can you just soak your rockwool in water? 24/0 all the way. Check my last post in link in my signature. Just keep the clipped end soaked. Just wish you guys an girls had my luck with clones, never had one die yet and I also have never used any rooting gel or powder. I use a homemade seethrough box courtesy of the chinese restaurant I order takeaway from lol. A quick update on the last post I left, if anyone needs any help in cloning I am freely available to show and tell how I do it. Here's a link to my grow that has clear pictures of the home made dome I use. What temp do my cutting need to kept at ?